Hospitals rely on a vast amount of plastic–from irrigation bottles to pitchers. What happens to that plastic when it’s reached the end of its uselessness? It is used once and then chucked into the garbage bin. Hospitals generate 33.8 pounds of waste every day per staffed bed. When this is multiplied across world hospital bed density the amount of waste generated is about 100 million tons per year. That is a staggering amount of waste to end up in landfills. When waste rots in landfills methane, a greenhouse gas (GHG) with a warming potential 23 times that of carbon, is emitted. A portion of the waste generated in hospitals is plastic and 85 percent of it is non-hazardous or free from infectious contamination. There is a huge opportunity for healthcare plastics to be part of the circular economy (CE) movement. A report by the Ellen MacArthur Foundation identified plastics in general as a frontier in the CE. Most of the value of plastic packaging material (95 percent), worth $80 to $120 a year, is lost. And plastic packaging has negative economic impacts value by the UN Environment Program (UNEP) at $40 billion. If that plastic could be recycled, the environmental impacts would be lessened and the value of it wouldn’t be lost to the economy. The Healthcare Plastics Recycling Coalition (HPRC) seeks to make healthcare plastic part of the CE. 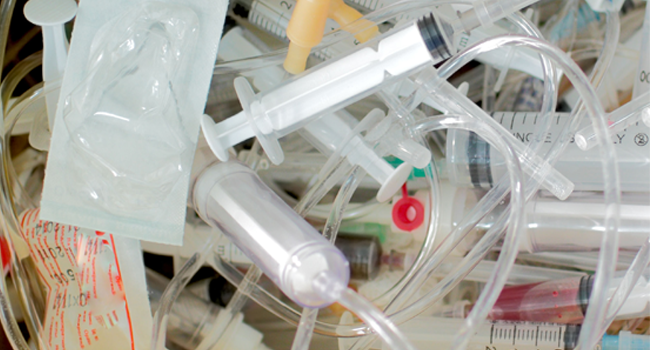 The organization conducted a survey in 2015 of hospital plastic waste recycling in the U.S. They surveyed 663 hospitals across the country and found that they were only collecting 40 percent or less of what could be recycled. Cafeterias and patient care areas are the two main places where plastics collection was occurring, the survey showed. There are challenges that make it harder to recycle plastic waste at hospitals. So, HPRC is bringing together stakeholders in the healthcare, recycling and waste management industries to figure out how it can be accomplished. One way it is doing so is through the launch of a pilot project in Chicago. Collaboring with the Plastics Industry Trade Association (SPI), a multi-hospital plastics recycling project was launched in the Chicago area which focuses on non-infectious plastic packaging and products waste from clinical areas of hospitals. The purpose of the project is to demonstrate that there is a viable business model for healthcare plastics recycling. The goal is to recycle 100 tons of plastics through the project’s duration. There are hospitals that already demonstrate recycling plastic waste is possible. One of those hospitals is Stanford Health Care in Palo Alto, California. In 2011, Stanford launched its first clinical recycling initiative in its main operating room, and partnered with HPRC in 2012 to conduct a pilot study. The program was then implemented in 2014 and 2015 in all inpatient units. In 2014, Stanford achieved a 38 percent diversion rate. Stanford is located in a city that is supportive and that has helped the hospital overcome the obstacles that exit to create a recycling program. The city of Palo Alto set a zero waste ordinance in 2005 with the goal of diverting waste from landfills.